"Uzay Hayaletleri" ("Mirage in Space") by Lee Falk and Fred Fredericks, part 2. "Orman Adamı" ("Mysterious Bigfoot") by Lee Falk and Fred Fredericks. "Ölüm Adası" ("The Bribe") by Lee Falk and Fred Fredericks, part 1. 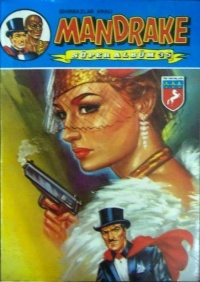 The cover was used first time for Mandrake Albüm #123. This page was last edited on 28 September 2014, at 10:36.